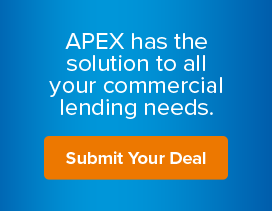 Apex is a direct lender that provides loans to individuals & businesses secured by commercial real estate. If you need a small-balance commercial mortgage to consolidate your debts, make improvements to your property or working capital, APEX can provide you with a lending solution that fits your needs! It is very simple to find out how APEX can help you – call us at (877) 604-5304 or fill out this form and a small-balance commercial mortgage specialist will contact you to discuss how we can help.